No you don't! They are shamelessly fawning tail-waggers while they are weak and insufferably arrogant once they catch up. Now that Roze takes White it's all kinds of 'leader of the pack' nonsense. Plus she is a shameless cheater, always claiming that the lack of opposable thumbs or even fingers for that matter means that her stones end up on the wrong intersections and have to be moved around. Plus her teaching style is hopeless. She fills it with all this ambiguity stuff that leaves me without a clue! But let me win for once and is she interested anymore? Why wasn't I born a cat-lover? 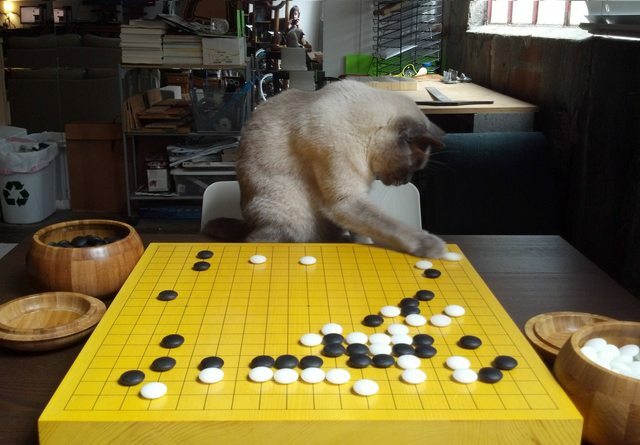 We need more pictures of Go boards and pets! They always make my day. He doesn't have a color preference, as long as he can push them onto the floor. My stones are 9.2mm Yunzi. I'm not sure what game that was. I was following a game on baduk tv and trying different stuff. Cool dog , cool pics ! to identify it for you if you email him the above photo alone (or two). Be careful, the pictures are HUGE...how does I shrink? New apartment and therefore new prominent position for the go board. The plum blossom room divider we purchased to block the glare on the tv helps to keep me secluded and focused. My view isn't as good as sefo's but there is something calming about headlights moving down dark alleys at night while you're safe inside playing go. Looks very serene and beautiful ! Online playing schedule: DGS most any time, IGS occassionally after 2130 CST, Tygem if I feel like getting destroyed. I was just about to settle in and study ladders in Lessons in the Fundamentals of Go tonight. Here's my setup with bonus a bonus kitty pic! As for electronics, I use an Eee PC running Trisquel Linux with qGo to play on IGS and very rarely I'll use an iPad to play SmartGo or use the IGS client there. I added the computer to the shot, though I never play a physical board and qGo simultaneously. My set is a Hansen "DELUXE" boxed Go set with two orphaned bowls from the cupboard and a placemat from my son's toy shelves that he uses with small collections of toys. The book stand is made out of a coat hanger. It's all very piecemeal, but it definitely works. My house is generally in some form of chaos at any given time, so a slightly mobile set is nice. Having a 3 year old makes an inexpensive setup useful. He already likes to play with the stones, though he doesn't know quite how the game works yet. I'll spare you pics of a toddler with the gear. I've also got a heavier bamboo goban that has 19x19 on one side and 9x9 on the other. I don't have any proper stones for it, but it was a wonderful gift from a kind friend. I don't like to lug it around the house, though I do break it out when friends with an interest drop in. Edit: Self hosted the pictures to avoid breaking the thread. Last edited by cmhobbs on Sun Nov 24, 2013 9:07 pm, edited 1 time in total. Hi cmhobbs, a bit smaller versions of your 3072x1728 photos. Enjoy go. Cats and go stones... Always a point of paranoia for me! Generally my cat refuses to take photos. However when she was deeply reading, I managed to take a quick pic. Mine is my desk with my board on one side and my laptop on the other. It's a pretty large desk, thankfully. No cats, though. "You have to walk before you can run. Black 1 was a walking move. my mind before, when I had not realized the true worth of Black 1." Like that dark wood board you have Abyssinica, when I purchased my board I was torn between that one and a natural grain one. Edit: Ill have to post a pic of my study area at some point.